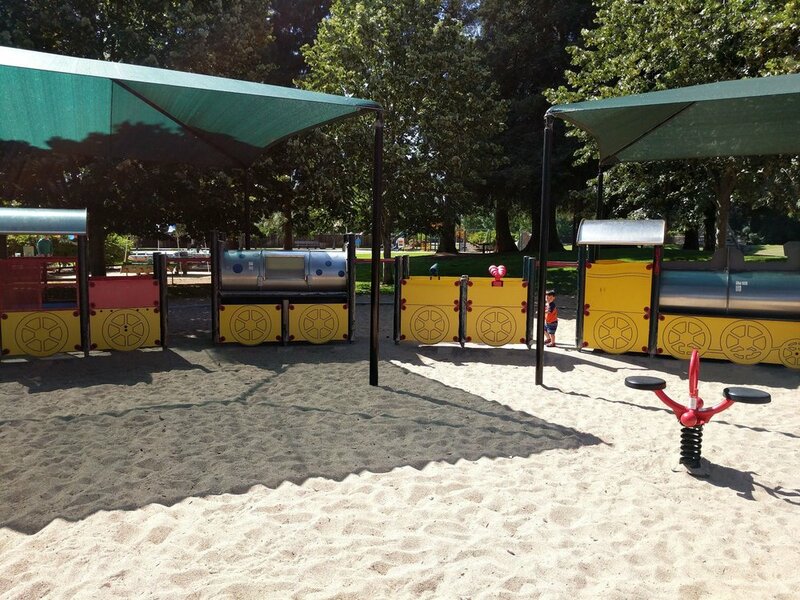 When the weather is nice and fresh air is needed (for you and the kids), it’s time to hit the playground. From one that has a dragon castle theme, to a hidden neighborhood gem and even one that caters to all abilities, the Peninsula has no shortage of great ones around. Check out our picks on where to take your little ones to get all that extra energy out. Play on! 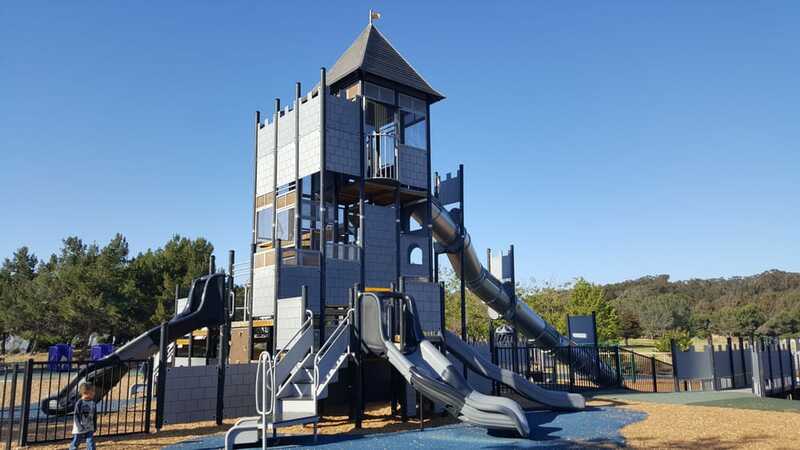 Dragon-obsessed kiddos will love this playground featuring a medieval two-story castle with a fun slide that lets little ones run with their imagination. Rocking horses, swings, dragons and tunnels are all a part of the fun. There is even a gated area for tots that like to wander off. Tip: After running the kids out at the playground, stop by CuriOdyssey. This fantastic science and wildlife center for kids is just down the road from the park. 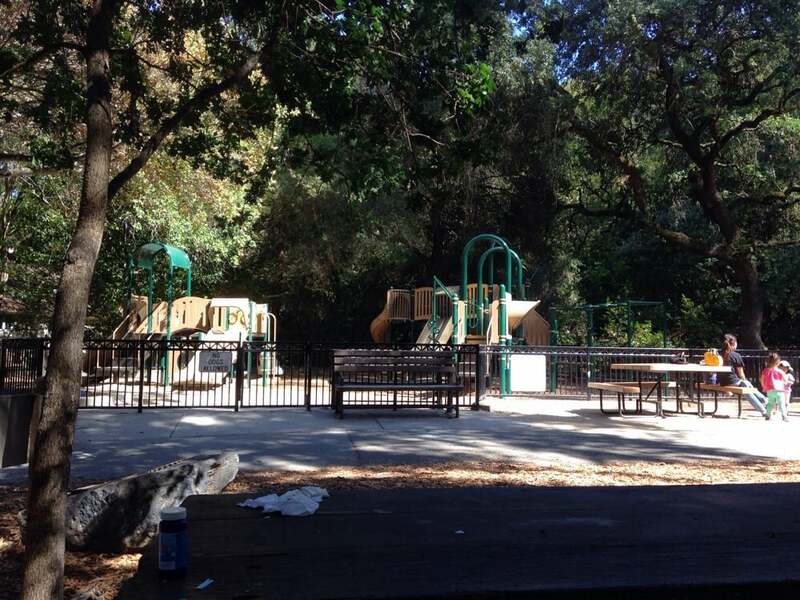 For beautiful views of the Bay as well as a fun place to let the kids run around, check out Cuernavaca Park in Burlingame. Since it’s close to SFO, planes are easily spotted lifting off the runway which is a sure hit with little pilots. Kids can run on the soft turf, build castles in the sand pit, take turns on the swings, go on the slides and climb on the play structures. 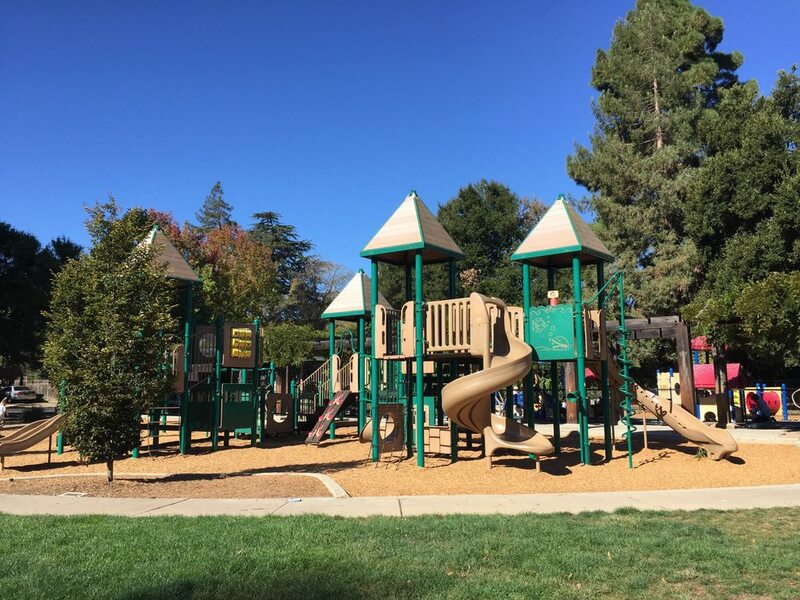 Walking distance to downtown San Mateo, Central Park not only has a big open playground complete with swings, sand, slides and play structures split up for big and little kids, but it’s also home to a lot more. The Japanese Tea Garden is so serene with plush greenery and koi fish, and the Arboretum really let you stop to smell the roses. If that wasn’t enough, there is also a (free) train ride. Renovated in 2016, the new playground is packed with fun and challenging play structures that kids could hang out in all day. Complete with a slide mountain, monkey bars, spire towers, water features, pendulum swings and a separate area for tots, it’s definitely one to check out. Tip: The playground is part of Beresford Park, which includes the Beresford Rec Center and the city’s only Community Garden. 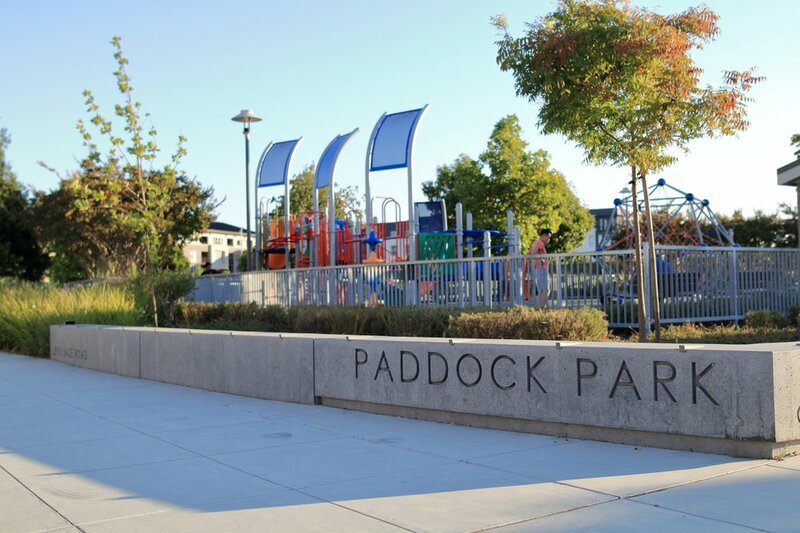 Part of the Bay Meadows community development in San Mateo, this small neighborhood playground is a hidden gem for those looking for something on the smaller scale with everything that makes playgrounds fun. Completely gated with separated areas for big kids and tots on soft blue turf, you’ll find slides, bucket swings, monkey bars, climbing structures and a good-sized sand pit. For a nature-inspired design complete with swings, climbing structures, slides and even a splash pad, this secluded neighborhood playground is not to be missed. Play structures are scattered throughout to encourage imaginative play as well as a cool teeter-totter and fort area to check out. For little ones, a gated tot lot lets them wander around freely. 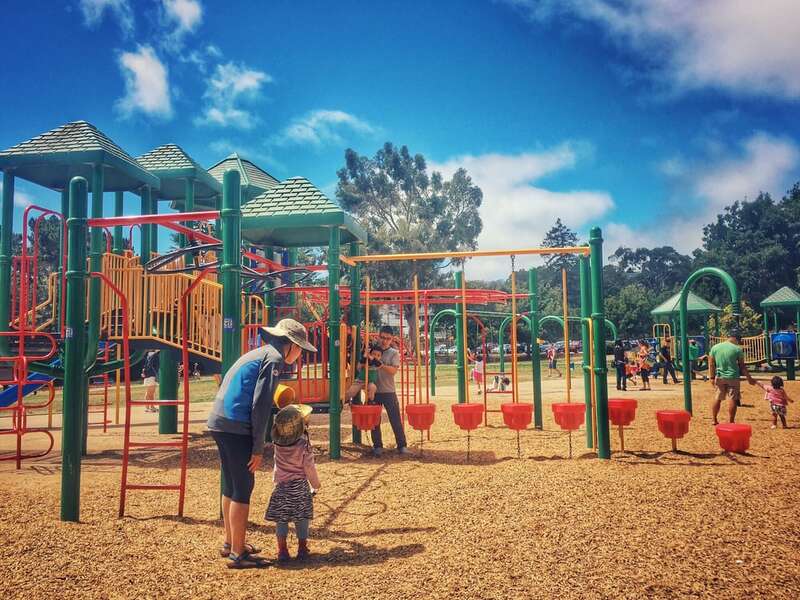 For kids that want slides and an open field, this Millbrae playground doesn’t disappoint. Separate areas for the under 5 set and big kids make sure everyone can climb, swing and slide. A rock wall, fast slides, sand boxes and play structures are all set up for fun, plus an open field to have a picnic or run around. 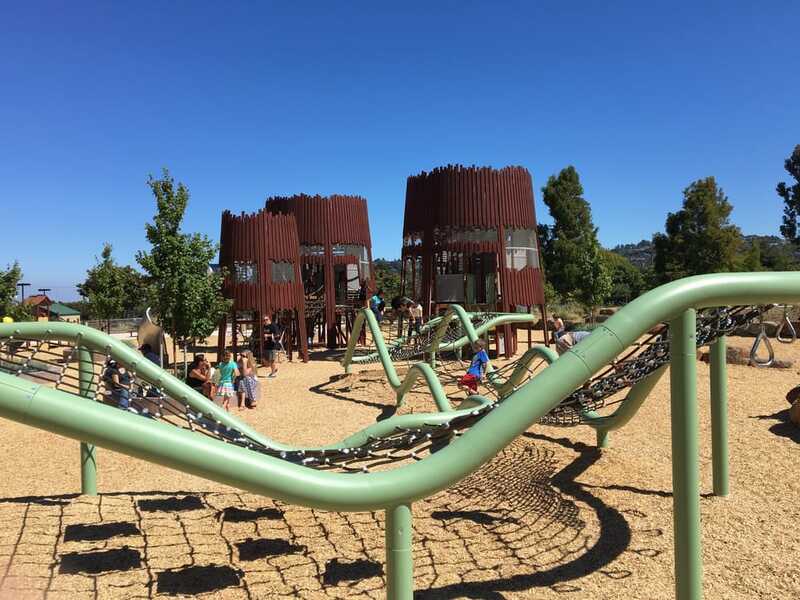 A neighborhood playground that is anything but small, Burton Park in San Carlos is a favorite with Bay Area parents. There are two separate areas for tots and big kids and a huge open lawn for a game of tag. On the weekends, you can spot the ice cream cart as well as stroller workouts happening throughout. Walking distance to downtown makes it easy to plan an early dinner after a day at the park. On hot days, be sure to check out Stafford Park for its water feature. Shooting 25 feet in the air, it’s a fun way to cool off on those hot days. 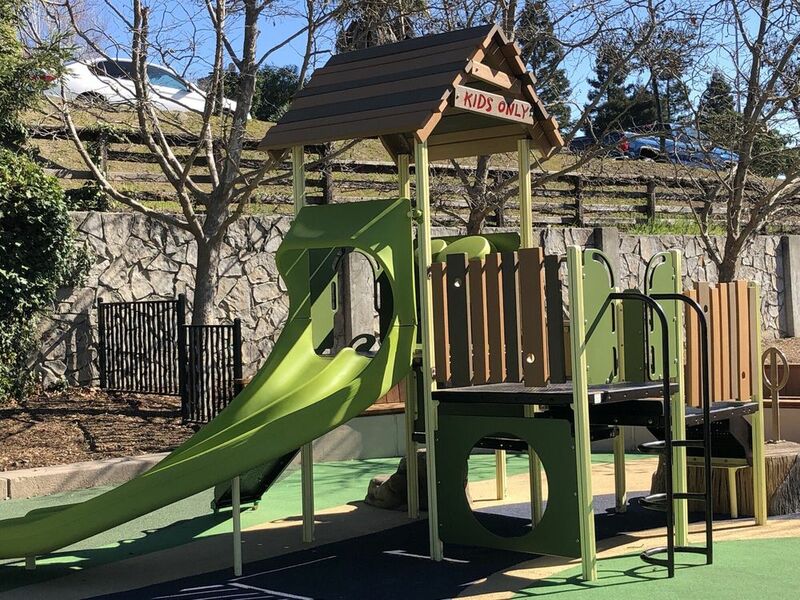 The playground also has multi-level climbing structures, slides and swings for the big kids, and a gated, renovated tot lot for little ones who like to wander. Grassy area and plenty of picnic tables make for a great weekend morning activity. Tip: The park is also home to Music in the Park, a free 10-week outdoor concert series in the summer that’s great for the whole family. For those kids just getting into nature, this little park in the heart of Belmont is a good one to check out. A creek runs through the property for morning walks or hikes with the littles. 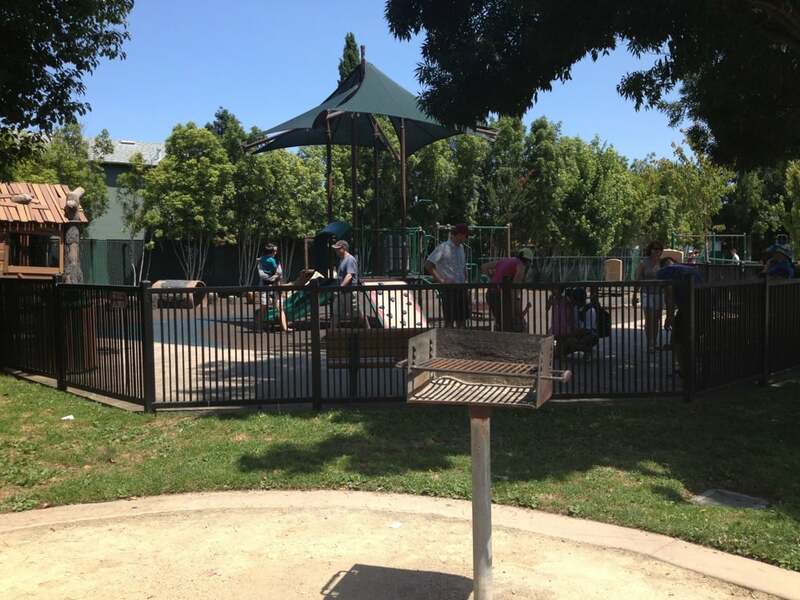 The gated playground has a slide and climbing structures with picnic tables and lots of trees for shade. During June and July, Concert in the Park is held here for the whole family to enjoy. Formerly an apricot orchard, this beautiful large park (over four acres!) has a lot of open space and shady trees. 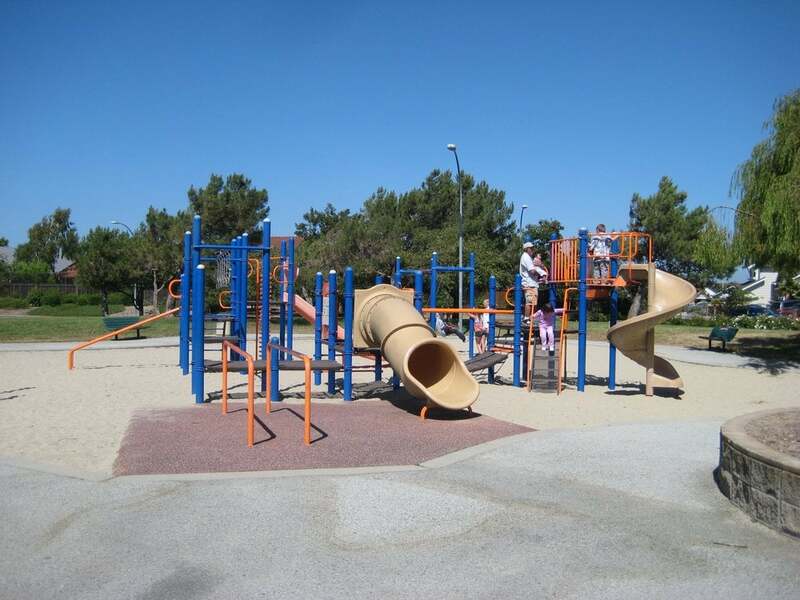 The playground is centrally located in the park with easy parking and tons of features to entertain the kiddos. Ideal for both toddlers and older kids, highlights include slides, climbing stones, a water table and a very charming yellow train. Clemo Ave., between Arastradero Rd. & Maybell Ave. This awesome playground was designed to include kids of all physical and cognitive abilities and it’s an incredible playground for any kid. Interactive music zone, massive slides, tree house, playhouse and play stage, swing zone, climbing structures and a separate zone for the under five set makes it a perfect place to visit. Pack a lunch and snag a picnic table for snack time. In the summer, they have live music here on Fridays. Tip: Try to plan your visit on a weekday or early on a weekend morning to avoid crowds. This neighborhood park with a large grassy area and shaded trees are great for a morning stroll. 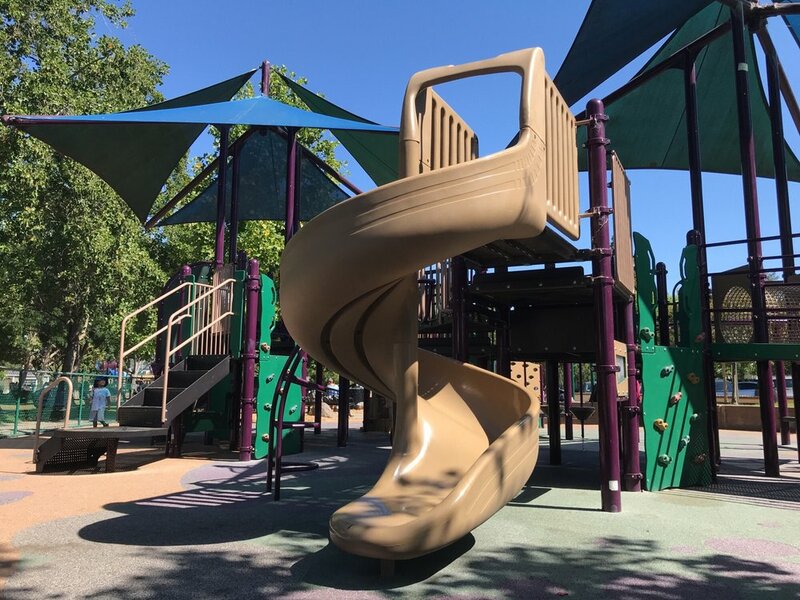 The playground has a separate play structure for toddlers to swing and slide while the big kids can test out their climbing skills on the rock wall and monkey bars. Sand area and covered picnic areas are a good option for parties and get-togethers. Newly renovated in 2018, this brand-new playground features an expanded area with separate structures for the under-two set on colorful padded turf. Slides, swings, rope climbing, challenging play features and plenty of open space allow little ones to run around. Plenty of parking and new bathrooms make potty time and diaper changes easier. 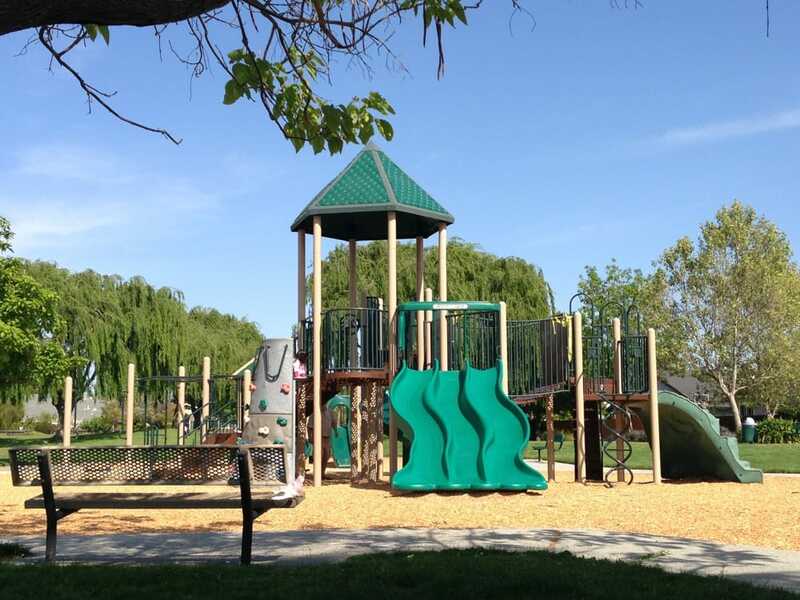 Spanning 7.5-acres and connected to Casanova Park, families love the wide-open space for kids to run, bike, or take an afternoon walk. The recently-updated play areas separated for tots and big kids include two sand pits, swings, slides, climbing structures, picnic tables and a large grassy area great for flying a kite on a nice day. Dogs are also welcome on leash! Tip: Casanova Park is connected by a bridge over Laurel Creek and is a smaller, fenced-in park with restrooms.